Writing thank you letters is slowly becoming a lost art. The increasing pace of life has robbed us the pleasure of sitting with a pen and pouring our hearts down on paper. We rarely take time to write nowadays. We don’t even jot down few sentences of appreciation. However, letters in any form holds a special place. This ancient way of communication still can bridge gaps and bring people closer. It is not only in our personal lives, thank you letters play a crucial role in business communications as well. A thank-you letter is generally sent after an interview. The right thank you letter can seal a deal, while the wrongly written one can ruin everything. 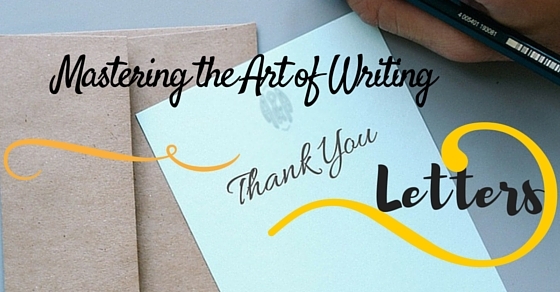 Writing in a precise way is the first step towards writing a perfect thank you letter. To write comprehensively, selection of words are very important. If the words are not selected judiciously then the message will not come out clearly. Words can either enhance or interfere with the meaning and understanding. Thus, if a letter is well-written the reader will be attentive and eager to read. Expressing oneself is important. To express yourself properly, using the correct punctuation and grammar makes it easier to read. The writer can be misunderstood, if the sentence is poorly punctuated and filled with grammatical errors. In Thank-you letters the most important thing is to prepare the letter paying more attention so that the chances of getting a reply increases. Formal letter can be monotonous. This is the reason, you need to make it as interesting as you can. Expressing enthusiasm is important for this reason. If you put your heart in the letter, your readers will surely feel the energy. This will make them feel the sincerity. The secret is to be true to whatever you are writing. First impressions are important. The reader must feel the sincerity of the writer. If the letter is written in colloquial terms and languages then the sincerity is lost. Letters which are formal must follow conventions of sincerity and certain rules. Hence, a letter written gracefully and sincerely can have a great impression on the minds of the concerned person. Apart from the minor rules and conventions of grammar the format of the letter and the pattern play a very important role. Be it a thank-you letter or a business letter, a carefully crafted letter always does the trick. A well-written thank-you letter is a good communication tool, and business templates will ensure high quality communication. The most widely used format for thank-you letters are block-style. Other than that, mentioning the addresses of the person concerned and salutation are two most important things to keep in mind. A writer writes a thank you letter in order to establish a mutual and up-front connection. Other than the above steps, the major rule that should be followed is the letter shouldn’t be lengthy. The letter shouldn’t be too big to comprehend; the gratitude should be expressed in brief statements and must also make future comments about the relationship that you want to share. It should also include words of appreciation to express how lucky you are to work in the existing company or to get this job opportunity. Thus, writing a thank you letter should always reflect the cordial relation between the boss and worker. But, you need to make sure to wrap it up in few lines. Remember that no one has the time or desire to read a lengthy letter. Everyone is hard pressed for time. Therefore, write in crispy language and limit yourself to one page only. In professional life, recommendations help a person rise in position and responsibility. In a thank-you letter you must mention how grateful you are and should show how honoured you are to be given the particular position. However, this does not mean you have the right to cross the professional boundary. You must remain professional while expressing your gratitude or desire. Professionalism should always be maintained even in the friendliest surroundings. This is the reason, it is important to learn professional language. Business English is an important tool which can help you in your career. From formal letter writing to report writing everything can be covered properly, if you know business English from depth. One takes out time to attend the interviews or take interviews. It is all the time and management of the person that is shown during such process. Therefore, when writing an appreciation letter you should mention how grateful you are to be attended even in the hectic schedules. You should mention that you have been extremely lucky knowing that your concerns have been listened to. If your concerns have been heard and strategies have been provided then you should show your gratitude all the more. In the hectic work-schedules workers generally lose out time for themselves. In such situations finding holidays are difficult so if the company grants holidays thanking them is necessary. In such letters, the person should mention that his absence might cause some problem and he will fill it up on time. He should appreciate the willingness and must promise to be more diligent in his work. A printed letter has more official value than the hand-written letters. A hand-written letter comes across as informal and too unprofessional. Even if the relationship is cordial and easy going at the end of the day it is the authorities that are receiving the letters, so special attention must be paid. A printed letter holds more value as it serves as a legal document and since it is dated it can serve well for further official purposes. Additionally, handwritten letters run the risk of being misunderstood. Everyone is not blessed with good handwriting. This is the reason, you should never try handwritten letter. 11. Why send thank you letters? It is good business when a thank-you letter is written in courtesy of referrals, opportunities, or for any other work done. Generally people become awkward and stiff to show gratitude after the work is completed. They tend to forget what effect the letter is going to have on the officials. A simple and a gracious thank-you can distinguish one candidate from another. More generally it tends to leave an everlasting impression and paves the way for good business relations. Few among the important ways to show respect towards one another in business is through business etiquettes. Good business manners may apply in multiple situations, but if thank-you letters are talked about; then the main aspect lies in the way of closing of the letter. It is all about relationships; it is about keeping the relation strong and making them work in the correct way. If mistakes are made in business manners, then the impression will remain with the recipient for a long time. Therefore knowing correct options of closing thank-you letters will help creating a perfect professional impression. The words like “Yours truly” and “Truly yours” are words that are highly acceptable in business and formal conversations. This phrase extends to a cordial and friendly relationship but doesn’t extend to become too impersonal. Other words like “Sincerely” describes the familiarity level and warmth between the sender of the Thank-you letter and to the recipient. However, certain variations like “Yours very sincerely” must be avoided and must only be used with long lasting relationships. A well-structured Thank-you letter shows respect for good communication and also shows the effort and time that has been put. Few rules are keeping the closing line same along with the tab line with date and name along with the signature. The salutation must be followed by a semicolon and a comma must be put after the salutation. Apart from “Sincerely” and “Yours Truly”, closings should only be used for framing proper thank-you letters. Other than that variations in closings like “cordially”, “with all due respect”, “respectfully yours” are not acceptable. In certain cases, when there might not be any further contact between the recipient and the sender then “best regards” can be replaced by “yours truly”. During any interview a person generally remains nervous and panicked. He might lose the opportunity to include all the details about one. Details generally refer to the skills and accomplishments that he had formerly and could help him in the upcoming job. Thank-you letter is the perfect letter to include this information. Hence, a thank-you letter should not show gratitude all throughout but must be used to tie in the additional information after thanking the officials. One of the serious mistakes that are often seen made by the interviewees is writing too many thank-you letters. A candidate might feel that he is enthusiastic regarding the job that he has been offered but too much of anything kills the interest of both the people. Thus, the candidate can either make or break the job with one thank-you letter. A thank-you letter is exclusive; a person who is writing it has gone through the whole experience himself, so thanking the employer should also be unique. The dumbest of the mistake that can be made by any candidate is to lose any opportunity of personalizing one’s own statement. The candidate must know that the employers are not sitting to see charitable behaviour. Thus, he or she must illustrate necessary things that were discussed during the meeting. He or she should keep the thank-you compact so that it doesn’t come across as overbearing. Lastly, when writing a thank-you letter, it is very important to mention that the person will return the assistance back and should express the integrity with graciousness. The letter must be customized according to the situation. The institution or the individual must be thanked and should express the impact it has made on the candidate. There are some points which you need to remember while writing the thank you letter. The letter being a formal one should be well structured. The structure must follow the conventional rules. There must be an introduction, a body and a conclusion. Remember not to make the introduction too long. Try to wrap it up as within a few lines. Also, the introduction should be in crispy language which attracts attention. You have only a couple of lines to get the readers interested. If you fail to get their attention on the first line, you lose them forever. People with limited time, scan through letters and emails. They don’t read everything. Your task is to make the job of the readers easy. Bullet point will help. Short paragraph is also important. Don’t write lengthy paragraphs which might make the reader lose interest. Don’t use fancy font which might make the reading job difficult. It’s not the adornment of the letter, it is the words that should impress the readers. The closing of the letter is as important as the beginning. Make sure to express gratitude several times before wrapping it up. Remind the person why you are writing the letter on the first place. This will stay in mind. Another important fact to remember is to add some personal touch. Though it is a formal letter, don’t forget to inquire about the wellbeing of the person you are writing to.